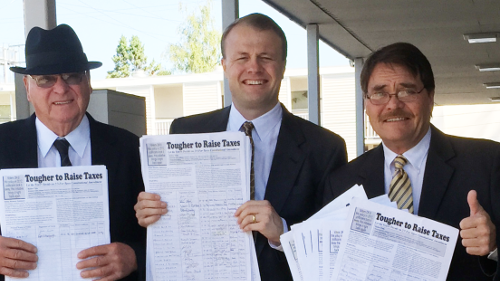 Tim Eyman just filed with the Secretary of State for a 2018 Initiative to ban the implementation of an income tax at the state and local level. Of course, the State of Washington does not currently have an income tax. This, like many of his other initiatives, probably would not stand up in court. This morning at 11 am in the Secretary of State’s office, we filed our initiative for 2018. It’s really exciting. We always spend the year before analyzing and deciding what initiative we’re going to do the following year. It’s a tough thing to do — trying to identify the greatest threat to the taxpayers the following year. * Pro-capital-gains-tax Democrat Manka Dhingra won the 45th district senate seat, giving complete control of the Legislature to the tax-obsessed Democrats. * One week after the election, the state supreme court issued a ruling ordering the 2018 legislature to “find” an additional $1 billion in tax revenue. The only way they can raise that much is by imposing an income tax, especially a capital gains income tax. Democrats and their liberal base have lusted after an income tax for decades and next year there’s a perfect storm for them to push it through. It’s clear that in 2018, there’s gonna be a full court press by Inslee and the Democrats to impose an income tax, especially a capital gains income tax. An income tax, especially a capital gains income tax is, by far, the greatest threat to the taxpayers next year. Our 2018 initiative — “We Don’t Want An Income Tax” — prohibits the state and any local government from imposing any kind of income tax, especially a capital gains income tax. It bans income taxes at the state level and bans income taxes at the local level (which means that if Seattle is successful in their judge-shopping effort to overturn previous court precedents, our initiative completely neuters their local ordinance while at the same time stopping a capital gains income tax at the state level too). This has put the anti-income-tax folks on the defensive, forcing us to play a constant game of whack a mole. It’s time to go on offense, especially since Inslee and the Democrats and the supreme court are conspiring to impose a capital gains income tax next year. For months, Seattle politicians have been asking judges: is our income tax constitutional? Our initiative asks the voters: is an income tax wanted? Our initiative stops this endless game of whack a mole and instead asks the voters to put this issue to rest once and for all. Unlike current law, our initiative specifically defines the word “income” in statute: For the purposes of this section, “income” means net income, total income, adjusted gross income, capital gains income, or any other portion, or type of income. “We Don’t Want An Income Tax” is going to be the most important and impactful initiative we’ve ever done. Taxpayers don’t talk about leaving Washington state if the sales tax goes up, but there are a ton of people who adamantly promise that if an income tax gets imposed, they’re outta here. Our side has been sitting around waiting to see what the pro-income tax forces are gonna do next. I’m sick of it. Our side has been holding its breath, hoping a bunch of Democrat-appointed, teachers-union-funded judges will save us. That’s dumb. It’s time for the good guys to go on offense and end this threat once and for all by letting the voters decide. “We Don’t Want An Income Tax” is the initiative we’re going to push next year. We’re working super hard to Bring Back Our $30 Tabs and stick it to Sound Transit — the December 29th deadline to turn-in signatures/petitions to the Secretary of State is fast approaching. 1) ask for petitions and help collect signatures. 2) donate (just think about how much you’ve saved over the years from our other two successful $30 Tabs Initiatives). The greatest threat to this statewide signature drive is OVERCONFIDENCE. Having qualified 16 initiatives for a statewide public vote over the years, we’ve made it seem easy. It’s not. It’s really tough. The only way we’re gonna make it is with a massive grassroots effort where everyone across the state helps. 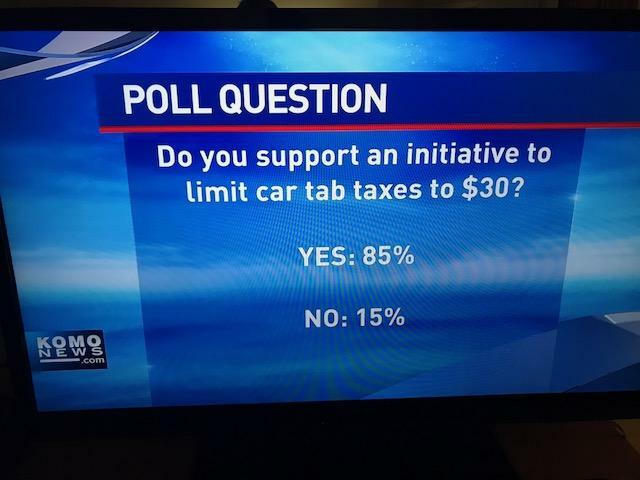 If you want to stick it to Sound Transit by Bringing Back Our $30 Tabs for everyone in the state of Washington (for cars, trucks, vans, SUVs, motorcycles, motor homes, RVs, 5th wheels, and other vehicles), then please help. You can go to our website right now www.VotersWantMoreChoices.com and make a secure on-line contribution by PayPal or VISA or M/C. OR, you can print this form, fill it out, and return it with a check or credit card information.